The Marina del Mar is the ideal resort for any vacation that enjoys the amenities of a resort yet the feel of a home-a-away-from-home. 76 pet-friendly rooms, studios, one and two bedroom accommodations available. Amenities include a heated pool, whirlpool, tennis courts, fitness center and complimentary continental breakfast. Las Vegas-style Casino Ship Boat Rentals & Fishing Charters John Pennekamp Underwater State Park Homestead International Speedway Keys Gate Championship Golf Course Dolphin Encounters Snorkel & Scuba Diving Glass Bottom Boat Each of our beautiful rooms feature central air, color cable TV, refrigerator, hair dryer, coffee maker and balconies overlooking the marina. Studios offer full kitchens, two queen size Murphy beds and a couch and coffee table or dining room area. One and two bedroom suites feature a full kitchen, living rooms and separate bedrooms. Make your stay with us carefree, exciting and fun! We're located on the Key Largo Harbor, in the same marina as our sister properties, the Holiday Inn Key Largo Resort and the Ramada Resort and Marina. Our Marina Del Mar offers complimentary continental breakfast, deepwater marina with overnight dockage available with electric and water hook-ups, boat rentals, a world class dive shop and a gift shop, both right on site. There are two lighted tennis courts, Olympic-size heated swimming pool and relaxing Jacuzzi, extensive Nautilus fitness center, huge outdoor sun deck and entertainment area and banquet and conference rooms. Watersports/Marina and Fishing Village Key Largoâ€™s claims to fame are the exciting watersports available in the area! 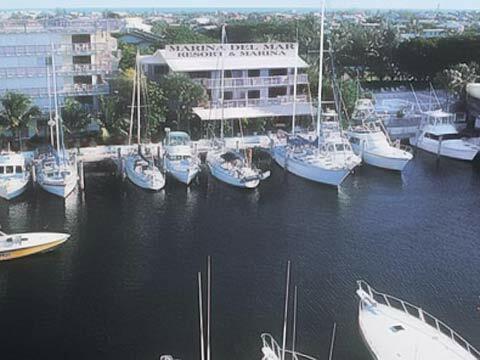 Our 75-slip marina offers charter boats for Deep Sea Fishing and Back Country Fishing. Snorkel and Dive trips to the famous John Pennekamp Coral Reef State Park and Marine Sanctuary leave twice daily but thatâ€™s not all there is to do! The marina has boat rentals, glass bottom boat, and sunset cruises so that you can enjoy the best that the beautiful blue water has to offer. If you have a boat, bring it along and dock it at our 75-slip deep-water marina located on the property. If you don't have a boat, rent or charter one from one of the many quality crafts available. Deep sea and back country fishing, glass bottom boat and dive and snorkel trips run daily.. Click here for more information on our Marina. Casino Gaming Ship All of our guests are invited to try their luck on the Casino Gaming Ship! The 100 foot gaming vessel is anchored 3 miles off shore. Sun Cruz Casino offers entertainment, hors d' oeuvres, and cocktails. Play Black Jack, Dice, Roulette, slots, and more! The Marina Del Mar Resort is the perfect venue for your next corporate meeting, seminar, banquet or social event. Family gatherings, fishing tournaments, or intimate meetings, the Marina Del Mar is the destination you're looking for. Our 80 slip marina has daily rentals perfect for the avid boater. To check group capacity and availability, fill out the form below or for more information, please contact our sales office at 305-453-7150.